That role was so pop culturally prevalent that I knew about it before I had even seen the movie, let alone have any inkling of who R. Lee Ermey was. I heard kids at my school wander around the hallway hollering “What’s your major malfunction?” all the time. Joe. E. Brown got “Nobody’s perfect”; R. Lee Ermey got “What’s your major malfunction?” But, like a certain sort of Springsteen fan knows that while “Born to Run” is worth every plaudit, the preceding “The Wild, the Innocent and the E Street Shuffle” is secretly just a little bit better, so too does a certain sort of movie fan know that while “What is your major malfunction” is worth every hosanna, there is another Ermey line that is secretly just a little bit better. As the simply named Police Captain in David Fincher’s “Seven”, R. Lee Ermey’s part was not big, mostly there as an authoritative presence overseeing Morgan Freeman and Brad Pitt’s detectives. He provides that necessary presence, as you might imagine, with gruff aplomb, but one scene stands out. It finds Freeman’s Somerset conversing with Ermey’s Captain cowhen the phone at the desk where the Captain is temporarily sitting rings. He answers, barks into the phone “This is not even my desk”, and hangs up. There is no narrative based reason for this moment to exist. In searching the online versions of the movie’s script this line, near as I can tell, was not even written, suggesting it was, like much of Ermey’s “Full Metal Jacket” dialogue, dreamt up by the actor himself. Maybe it was, maybe it wasn’t, but the moment feels offhand, and not even improvised with a purpose as much as ad-libbed. You'll be pleased to know that line was indeed improvised. Fincher explains it on the commentary track. 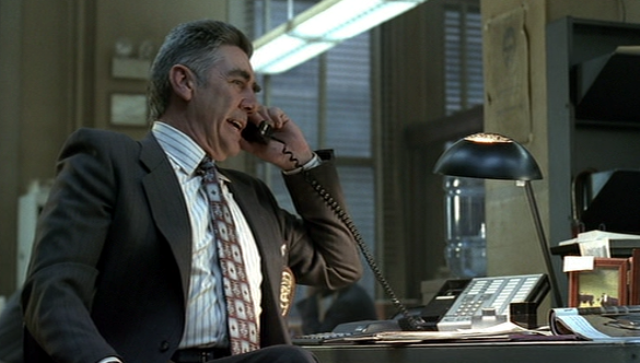 The phones were ringing in the background for atmosphere, and Ermey just got sick of the distraction. Fincher left it in because he rightfully thought it was a great line. "The phones were ringing in the background for atmosphere, and Ermey just got sick of the distraction." That's awesome! Thank you!